Hemp oil is rich in Essential Fatty Acids and gets absorbed through the skin, replenishing the lipids that have been damaged by the sun or dry air. It does not leave an oily residue on the skins surface. Hemp oil is known for penetrating into wood and leather and preserving it, and is good as a “drying” oil in paints and inks. 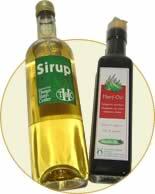 Hemp oil is also a non-toxic alternative to many petro-chemical products.